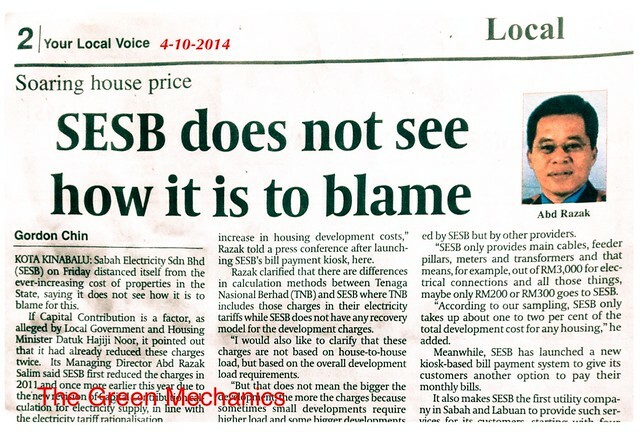 SESB believes it is not to blame for the soaring house price in the state. I tend to agree. Between 2011 and now the utility company has reduced the Capital Contribution (a sum contributed by the developer when applying for power supply for an intended project), twice - once in 2011 another one early this year. From mathematical point of view you would expect the the price to have been reduced, if Capital Contribution is even a factor. But the cost of properties doesn't follow mathematical logic, you say. Perhaps. But the cost should follow logical thinking. If it is a factor in determining the cost of a house, for instance, then there should be price reduction in those years when the capital contribution was revised. Or, at least distribute the benefit to the buyers in a tangible form; by withholding the fast soaring house price. Fair enough? Clipping from local daily, the Daily Express on 4 October 2014. Point aside, Daily Express never fail to amaze me with so many oversights. The person in the above picture (inset) is not Abd Razak. He's the former Managing Director of SESB, Ir. Baharin Din. Come on! Give Ir. Abd Razak Sallim some face. You are not doing your homework as reporter. I've seen more than once in your paper that Abd Razak was given a 'new face'. Back to business. Really, soaring house price should not be blamed on SESB. It's a lame excuse on the part of the developers. But ideally, SESB should bear the cost of supplying power to the consumer; if not now maybe in the near future when is has factored in this cost into its power tariff. I had a recent experience of upgrading the power supply to one of our facilities - a 1500KVA substation. Apart from the capital contribution of over RM200k, we were also asked to bear the cost of installing additional switchgear for a 2-in-1-out 11kV supply system. This, according to SESB, is in the name of 'supply security' because if supply from Source A failed, Source B would automatically kick in and supply to our facility would not be disrupted. Now, in the name of 'supply security' the utility company should be the one to pay for it rather than the end user. The onus is on them to ensure better power supply. Not me, not you the consumers. To property developers, especially housing development, please find better explanation to your soaring house price.